Querium is a performance assessment platform aimed at students who struggle with Science, Technology, Engineering, and Math (STEM).. The mobile-driven software prepares students for college-level classes in lieu of paying for generic remedial classes that do not apply towards graduation. Querium’s platform offers interactive, education modules curated for the students’ career aspirations. For example, if a student is interested in healthcare, the math problem will be stated in the context of dosage or heart rate. The Austin-based education company is only a year old but gaining traction, in spite of the large market of educational resources. This is largely because the product is unique to the market as the first mobile-based personalized education platform. Querium’s quick success also came from being in the right place at the right time. Recent changes in legislation called the Texas Success Initiative (TSI) began in August 2013. The initiative requires some students to take an assessment test before enrolling in college. Querium learned of the new legislation in the early summer which gave them plenty of time to build a solution to help colleges meet state requirements. Under the new legislation, Texas colleges must have developmental instruction in place to help those students who don’t pass the exam. “We’re able to come in on a white horse and meet all of their needs,” Smith said. Querium’s quick response to new TSI requirements gave them an in with many of the colleges they have partnered with and plan to continue this model. They have targeted ten states with upcoming initiatives similar to the TSI and are currently fundraising to grow nationally. They are also working on building out the program for licensing. 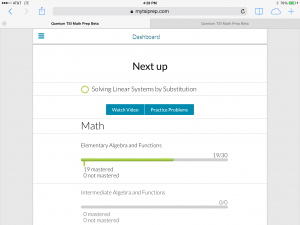 Currently, Querium is developing software that would allow students to do math on a tablet. The software would convert the hand written math for the teacher to analyze how the student is doing. The software, which Smith noted is unique in the market, should be ready by enrollment of Fall 2014.